Tuesday's Davidson Town Board meeting brought an update on pedestrian safety from Chief Miller and Public Information Officer Christina Shaul. One of the big topics was the impact of the lower speed limits on Davidson-Concord Road implemented in June. That's when speed limits were reduced to no more than 45mph and down to 35mph starting at the Beaver Dam House coming into town. Accidents were compared from June 1st through late September for both 2015 and 2016. As you can see there was actually 1 more accident during the period this year. It's hard to say if speed was a major factor in any of them. What was definitely true is that enforcement was way up. Increasing enforcement was actually a condition of NCDOT lowering the speed limit. In 2015 only one ticket was written on the road. This year? 36 tickets and 17 warnings were written! As someone who lives on the road and drives it every day, it seems noticeably safer from a speed perspective. But don't say you weren't warned. The DPD is definitely watching! 1. 07 19 2015 @ 1816 hours. Davidson Concord Road @ Parting Oaks Lane. Vehicle #1 left Parting Oaks and pulled into oncoming traffic from Davidson Concord Road, striking Vehicle #2 in the right rear. No injuries. 2. 07 02 2015 @ 1732 hours. Davidson Concord Road @ East Rocky River roundabout. Vehicles #1 and #2 were northbound on Davidson Concord Road. As Vehicle #2 approached the roundabout, they slowed, yielding to traffic in the roundabout. Vehicle #1 failed to reduce speed and collided with Vehicle #2. Medic called to the scene. No transport. 3. 08 31 2015 @ 0836 hours. Davidson Concord Road @ NC 73. Vehicle #2 was stopped on Davidson Concord Road, waiting for oncoming traffic. Vehicle #1 struck Vehicle #2 in the left rear when it failed to stop. 1. 07 14 2016 @ 1544 hours. Davidson Concord Road @ Barnhardt Road. Vehicle #2 was stopped waiting to make a turn onto Barnhardt Road. Vehicle #1 failed to slow, striking Vehicle #2 in the rear. Both vehicles sustained major damage rendering them inoperable. 2. 06 17 2016 @ 0605 hours. Davidson Concord Road @ Appolinaire Drive. Vehicle #1 was traveling north on Davidson Concord Road. Driver stated that an animal ran in front of her vehicle. She veered off to the right side of the road, colliding with a metal Caution sign, damaging the right side door and rear quarter panel. 3. 07 22 2016 @ 1649 hours. Davidson Concord Road @ NC 73. Vehicle #1 was traveling south on Davidson Concord Road. Vehicle #2 was stopped due to vehicular traffic on NC73. Vehicle 1 struck Vehicle #2 in the rear. 4. 07 29 2016 @ 1714 hours. Davidson Concord Road @ June Washam Road. Vehicle #1 pulled off the roadway to make a U-turn. Vehicle #2 continued with its northbound travel. Vehicle #2 was struck in the front left corner by Vehicle #1. 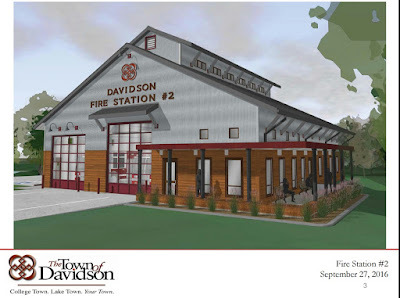 For years Davidson's East Side has needed its own fire station. Now, the wait is almost over as the town nears finalization of plans to start construction on town-owned land next to the Beaver Dam House on Davidson-Concord Road. At Tuesday's Board meeting Fire Chief Bo Fitzgerald and Assistant Town Manager Dawn Blobaum reviewed the final costs and discussed the contractor selected to build the project with a possible start date sometime in late October. Contractor Pro Construction of Jacksonville, NC was the low cost bidder coming in at $1.87 million. After some "value engineering" and adding in some scaled back "soft costs", the total project will be $2.13 million. This is expected to be a 50 year solution for the town's needs, but there is room on the site to expand if needed. Commissioner Rodney Graham asked about the selection of a builder that was not local. To that Blobaum responded that state rules require the town to select the lowest cost "responsive and responsible" bidder. In this case, that was Pro Construction. Not only did they come in lowest but they have experience building fire stations. Blobaum also pointed out in this case because of the good drawings the town had on hand, all of the bids came in within a tight range with only $140,000 separating the lowest to highest bids. This project will eliminate the need for the town to continue its contract with the Odell fire department in Cabarrus Co. Odell had been covering the far eastern part of Davidson to allow for a better ISO rating for that part of town which greatly helps insurance rates. After going around the room to get "nods" of agreement - to be clear not a "vote" just "nods" - the Board indicated staff could move forward with the last phases of the contract preparation. Barring something unexpected, the Board will vote on the contract for Pro Construction at its October 11th meeting. Construction could begin any time after that. In light of Mayor Roberts mishandling of the situation on the ground last week in the aftermath of the officer involved shooting that resulted in the death of Keith Scott, the above quote sounds almost comical. Unfortunately, there's nothing funny about it. Roberts uttered those words during a debate last year against her Republican opponent, Edwin Peacock. Readers may remember the unlikely fact that the Charlotte Observer actually endorsed Peacock in that race. Yes, the Observer endorsed a Republican. In the aftermath of last week's events, it's now clear why. The events in Charlotte unfolded in two ways that were materially different than the unrest occurring in most other cities after officer involved deaths. First, things spun out of control in Charlotte more quickly than in other cities. On the night Scott was killed, violent unrest occurred comparatively quickly. Tuesday night/Wednesday morning just hours after the shooting, I-85 was shut down as protesters stopped trucks and burned cargo on a major interstate highway. The Observer has a good article on that chaos here. Looking at Ferguson, Baltimore, and St Paul, violent protest did not start until well after the incidents which sparked them. In two cases (Baltimore and St Paul) riots didn't start until after the funeral of the person killed. What happened in Charlotte was closer in its timing to what occurred in Milwaukee. The violence there started the same day just like in Charlotte. Fortunately, while the timing was similar, the Queen City was spared the duration and sheer destruction seen in Wisconsin. A leader takes responsibility. A leader does not pass the buck. The second differentiating aspect of the events in Charlotte could have a more far reaching impact. It was widely reported originally that most of those arrested on Wednesday night were from out of state. (UPDATED - A regular reader pointed out the source of the original report saying most arrested were out of towners has since recanted that statement. See here.) Regardless, the mishandling of the early events in Charlotte has given the "professional protesters" a new play for their playbook. In the other examples of violent protests in other cities, the riots did not occur in the business district. In Charlotte, it did. That's an important difference because it effectively shut down the heart of the city for two days as major employers kept people home. Seeing this result has to be considered a victory for those seeking conflict. Don't be surprised if you see it repeated elsewhere. Would having more state assistance on the ground Wednesday night have made a difference? It is hard to know for sure, but not having those extra resources sure looks to have made things worse. Even just accepting some State Police resources if not the National Guard may have given enough manpower to keep things under control. What we know for sure is that once a state of emergency was declared and the National Guard was called out, there wasn't any more significant conflict. The protests at times on Thursday night were tense and certainly could have gotten out of control, but with so many Police, State Troopers, and National Guard on the ground things never got violent. Cities in the United States absolutely do not want to get in the habit of having curfews, troops in combat gear on street corners, and Humvees patrolling the streets. Stronger leadership from the Mayor's Office could have prevented that from being necessary. Help was offered but not accepted until too late. That led to a second rebuke from the Observer on Saturday regarding her leadership - or lack thereof. Ouch! You might not notice it unless you are in a car looking for a place to park. The parking lines are facing the "wrong" way, but no, that is not a mistake. It's by design. These spots by the new Linden Appartments on Jetton Street are Davidson's first example of what's called "reverse angle parking". Instead of the parking angles allowing a driver to pull in head first to the right, they require drivers to back into the spots. This article provided by Davidson Public Works manager, Doug Wright, was posted on the Lebanon, NH municipal site. It gives a good overview of this parking setup. The reason to use this setup can be summed up in one word - safety. Reiterating some of the points in the above article Wright explains that reverse angle parking is safer because "passengers exiting the car are directed toward the sidewalk, unloading takes place on the sidewalk, bicycles are more visible when drivers head out vs. backing out." While the spots on Jetton may be out of the way for most Davidsonians, the Town is looking at them as an option for a more prominent location - Main Street. 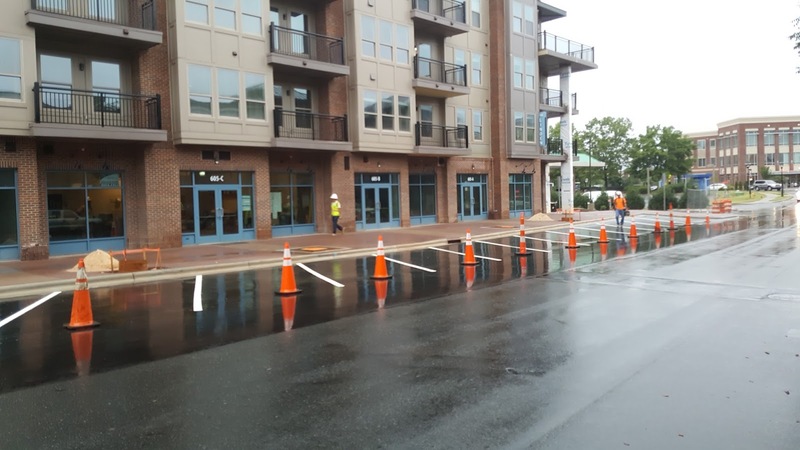 In August the Board approved a $30,000 budget amendment to begin studying Main Street improvements as well as planning for roundabouts at Davidson-Concord/Pine as well as Davidson-Concord/Robert-Walker. Write says the Main Street improvements include this reverse angle parking idea. According to Wright, "the area under consideration is the front-angled parking in front of the Village Green and CVS. The other major component is a proposed extension of the southbound left turn lane onto Concord, to allow more vehicle storage. Both are being studied to reduce traffic congestion through town, with improved safety an additional benefit." Wright also says these plans include"evaluating a mid-block crossing on Main St between Concord and Chairman Blake." While certainly these changes if implemented will take getting used to, it's nice to see the town following through on its commitment to improve pedestrian safety. Speaking of pedestrian safety, the Board will receive an update on these efforts from Chief Miller anda Public Information Officer Christina Shaul at Tuesday's Board meeting. A few weeks ago, fellow Herald columnist Eric Rowell wrote a piece on how to make a public records request. From what I understand it has been well received with several people following up to get more information. That is a great thing for helping ensure more transparency in local government. This week I thought I would pass along a few more of these tools and provide an example of how they are used. Tool #1: Google Alerts – Google allows anyone to set up alerts on any topic using key words. Anytime a story appears anywhere in cyberspace you’ll get a daily email. Set up a few alerts with the name of your town and one for each elected official. You won’t get overwhelmed with emails but when something happens you will know. If you save these emails, you have an easy reference to all that’s been written on the subject. Tool #2: Town Agendas – All the local towns keep their agendas online. Look at the agendas for the Planning Board and Design Review Board for early warning signs of new development projects. By the time things show up on the Commissioners’ agenda it’s usually too late. Commissioners also discuss important details at so called “pre meetings” and dinner meetings. Know that whenever a majority of Commissioners are present, the meeting is open to the public so you can attend if you want. Tool #3: Online Public Records – Almost as important as the public records request are the available online records systems. In the old days one had to practically be a trained detective to acquire information. Now, so much is available onljne that the challenge is sifting through it all. Property records can be found at Mecklenburg Polaris. Business records can be found on the NC Secretary of State site at SOSNC.gov. So, let’s take an example from the development world, something that impacts almost all of us in this fast growing region. What should you do if you hear around town or from a neighbor that some new development is going in on the property around the corner? 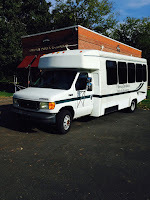 First, go to Polaris3g at CharMeck.org and look up the property. You can search for it or find it using the map. Look at the information there. If the property is something long planned for development it very well may be owned by an LLC – meaning you can’t see the real owner’s name. Never fear, the NC Secretary of State website will have what you need. Go to SOSNC.gov and look up the LLC. Often the officers of the LLC will be listed or at the least the registered agent for the company. The names listed here will often be developers or real estate attorneys. You can also look at the information on file at the Register of Deeds via the links in Polaris3g to find more information on who may be involved with the property and potential development. With these names in hand you’ll better be able to understand how the information in a records request all fits together if you choose to go that route. Do this a few times on a few developments and you’ll realize you often see the same names, over, and over, and over again. After a little practice, you’ll realize those steps only took a few minutes and you’ll be asking better questions of your town hall. Mix these steps together with regularly reading your Google alerts and scanning the agendas for your town meetings – maybe even attend a few in person, and you’ll soon be surprised at what you learn. Ahead of the October 3rd public information session at Town Hall, the town took a few of the mandated steps on Thursday to start publicizing the Hyatt Place hotel project. By our count per the list provided by the Town, 29 residential recipients will receive the notice. The were several other properties also listed including others owned by the owner of the hotel site and two owned by the Town itself. Here are the town requirements for who receives notice. to other affected parties as determined by the Planning Director. The applicant shall prepare the notice, which shall be approved by the Planning Director. The notices with addressed stamped envelopes shall be given to the Planning Director not less than fourteen (14) days prior to the public input session and mailed by the Planning Director not less than ten 10 days prior to the date of the public input session. The bold line in the above is interesting. From what can be determined by who is not on the list, the residents who live on the back of Spinnaker Cove are not receiving a notice, but those in the front are getting one. The same can be said for the many of the residents in the West Side neighborhood. Only a few are getting the notice while many are not. None of the residents down Gateway at Jetton received the notice. Per the town's planning ordinance notifying all these people could have been done if they were identified as "affected". Apparently, they are not. In addition to these notices the town put out its required press release Thursday. Citizens are invited to a public input session, led by developer Beacon IMG, Inc., on the proposed conditional master plan amendment to change the permitted use from two mixed-use commercial/residential buildings to a hotel at the corner of Griffith Street and Davidson Gateway Drive. The site is located at 127 Davidson Gateway Drive, consists of 2.1 acres, and currently serves as a surface parking lot. The public input session will be held on Monday, October 3 from 4:00 to 7:00 p.m. in the Davidson Town Hall board room. It will be an open house format with no formal presentation. The hotel developer and project team, along with members of the Davidson Planning Department, will be present to discuss the proposed development and answer any questions. All citizens are invited to review the initial plans and provide comment. Mark your calendars and plan to be there! POSTPONED - Davidson Depot Information Session pushed out! Tuesday, aShortChronicle told you about the meeting involving a select group of citizens last week regarding the Davidson Depot project. In that post we told you about the upcoming public information session on September 29th. That notice had been on the project's page on the town website for weeks. Interestingly, a couple hours after that post hit the web late Tuesday night, the town emailed out the below press release announcing the same. That email landed at 12:14am Wednesday morning. Citizens are invited to a public information session on the Davidson Depot development on the Metrolina Warehouse site on Depot Street led by developer Miller-Valentine Group. This 5.15-acre property is located on Depot Street between the railroad, Eden Street, and Sloan Street and will feature approximately 180 apartments. 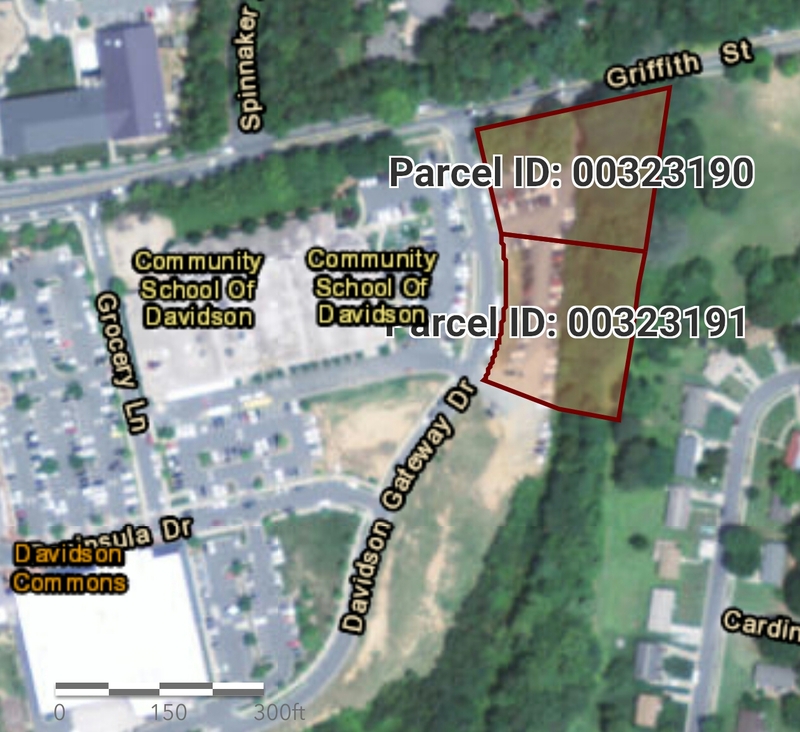 The developer is coordinating with the North Carolina Department of Environmental Quality Brownfields Program to define the activity needed to make the site suitable for reuse since the parcel contains underground asbestos. The public input session will be held on Thursday, September 29 between 4:00 and 7:00 p.m. in the Davidson Town Hall board room. There will be two identical short presentations: one at 4:00 p.m. and one at 6:00 p.m. to educate citizens about the project. Members from the developer’s team and the state’s Brownfields Program will be available to share information and answer questions throughout the session. All citizens are invited to attend. That invitation was short lived however. A little before 5pm Wednesday the town sent out the below notice postponing the event. Miller-Valentine Group, the developer for this project, had originally planned to host a public information session on September 29, but have made the decision to postpone it. They wish to thank the community for its attendance, thoughtful comments and questions regarding the Davidson Depot project at their September 15 meeting held specifically for adjacent property owners. In order to give the questions raised at this meeting the thought and consideration they deserve, the company feels it is appropriate to postpone the September 29th meeting in order to further advance its redevelopment plans. Miller-Valentine Group appreciates the community’s patience in this matter and looks forward to meeting again early next year. That's at least three months. That seems like an awfully long time to delay. Also, let's be very clear about last week's "community" meeting. The meeting was not a "public" meeting. It was not advertised. It did not appear on the town website. It did not include people from all the neighboring subdivisions. It was a hand picked group that raised a number of valid concerns. Concerns would have been raised completely behind closed doors if not for a leaked email that landed at aShortChronicle. Now, the long planned public meeting gets "postponed". While the people invited to last week's meeting certainly are the most directly impacted, they aren't the only ones. Furthermore, they certainly aren't the only ones with an opinion of the safety aspects of the cleanup. Unfortunately, those added opinions are going to have to wait. The Davidson Depot developers held a meeting at Town Hall last Thursday with people living nearest to the property. Most of those who attended were long time residents of the West Side neighborhood. About 25 attendees looked to be there. The meeting wasn't advertised to the "public" per se, but an email circulated from non Town Hall sources Thursday afternoon landed in the inbox here at aShortChronicle. With the recent swirl about the on again/off again closed sessions and inconclusive information about possible town financial support for the project, it seemed like a good idea to check it out. aShortChronicle confirmed with the town Public Information Officer, Christina Shaul, that it was OK to stay since this was technically the developer's meeting though Town Hall was clearly helping with the coordination. Two Commissioners, Rodney Graham and Jim Fuller, were there, but that was below quorum so technically the meeting didn't need to be open to the public. The meeting was intended to be mostly about how the cleanup of the asbestos on the site would occur. However, before that piece of the presentation occurred, a significant bit of uncomfortable and disturbing history with the site needed to be aired. First, the current owner spoke. Her father bought the site in the mid 1970s with its contamination issues unbeknownst to him or the family. They've supposedly been trying to sell it for 15 years and gone through 5 buyers. After the contamination was revealed in 1984 the cleanup costs have made redevelopment of the site very difficult and prohibitively expensive. The stories told after the owner spoke paint an even more dire picture of the history of the site. Numerous lifelong West Side residents told heart wrenching stories of the impact the asbestos factory has had on the community over decades. Multiple people told stories of loved ones who they believed had died because of working there. Their biggest concerns were clearly about the safety of the cleanup effort. Readers can see for themselves what those cleanup plans include when the project has its public information session on September 29. "public information session on Thursday, September 29 from 4:00 to 7:00 p.m. at Davidson Town Hall. There will be a formal presentation at 4:00 p.m. and 6:00 p.m. and members of the development team and state's Brownfields Program will be available throughout to share information and answer questions." During the discussion one attendee did ask about a part of the story aShortChronicle has been covering. Would the Town be footing the bill for the cleanup? The answer is "partially" but no more than they would if anyone were to redevelop the project. The project site will be a part of the State's "Brownfields" Program which does allow for 5 years of sliding scale tax credits once the project cleanup is verified by the state. That's a credit any developer for any project would very likely utilize. Why that was never clearly explained in the previous questions asked regarding town funding is unclear. However, it was nice to see the citizen who asked the original question ask a follow-up question. "Would there be any town specific funding for the project?" The answer from developer Charlie Rulick with the Miller Valentine Group was a clear "no". In a follow-up email to Rulick last Friday he reiterated "nothing other than the Brownfield tax abatement is being considered." On Friday after getting this response from Rulick, the project's local attorney, Susan Irvin, called to provide a little more detail. Irvin wanted to pass along that even with the 90% abatement in the first year, the town would receive more than twice the revenue it does now. The property is currently valued right at $1 million and brings in $3,500 to Davidson. Using those numbers that would put a ballpark value of more than $20 million on the completed project. Interestingly though, when asked through the company's local marketing firm if a value was available, Miller-Valentine declined to provide a value saying it was too early to do so. What was clear from the meeting however was that this site has caused a lot of heartache over many years for those owning it and those living near it. Regardless of what people feel about the idea of 183 apartments there, the asbestos issue needs to be addressed and whenever that happens it will cost the town for a few years. A local pol asked me a couple weeks ago about the finance reports for the candidates in the race for NC House 98. With only Q2 reports in the system at NCSBE.gov it looked like money might not be a huge factor in the race. Since the Q2 reports are almost a full quarter behind at this point lots more money has likely flowed in for both candidates by now. A couple weeks later it seems the big money may not be coming from the campaigns, but from Washington DC instead. 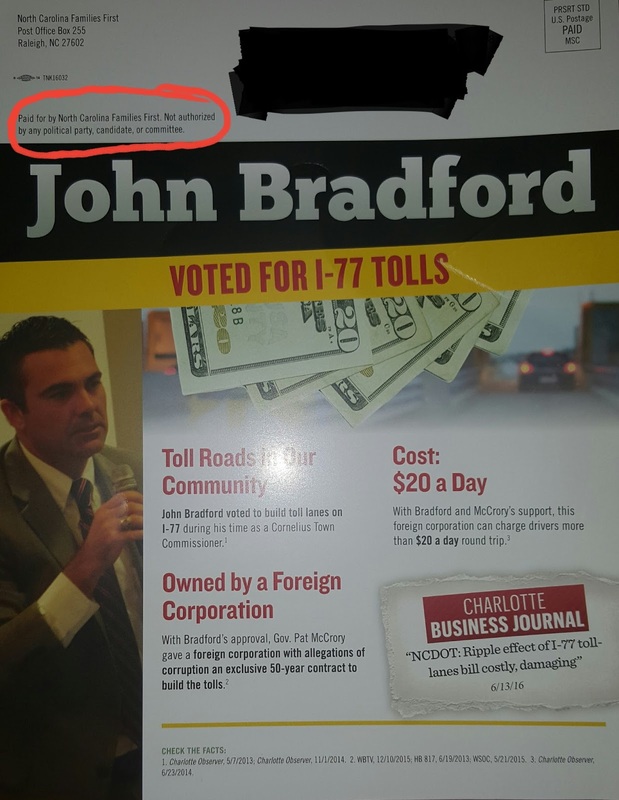 Since that exchange we've seen the beginning of a wave of flyers attacking Bradford from "NC Families First" a 527 dark money outfit out of Raleigh. One unconfirmed source tells aShortChronicle they had heard there may be a couple dozen of these before election day. The fact that 3 have already hit since last Wednesday is a good indication that may be true. In the mechanics of an election, it wouldn't make sense to fire off three of these this far out from election day if you weren't going to keep doing it. An earlier post mentioned that NC Families First was active in the 2014 campaign, but that there wasn't any information on FollowNCMoney.org for them this cycle. That's true. HOWEVER...we here at aShortChronicle are a persistent lot. 527 organizations have to report to the IRS, so it seemed like a good idea to check IRS.gov to see what we could find. The Q2 reports there for "NC Families First" show the below "contributions" and "expenditures"
$1.475m from NC Citizens for Protecting Our Schools, a group that historically receives most of its cash from the NEA...in Washington, DC. While it's obvious a lot of this cash will flow to support Roy Cooper in his race against Gov McCrory, a good bit is left to pound other candidates into submission. Expect the anti-Bradford flyers to keep on coming - funded by Washington cash. 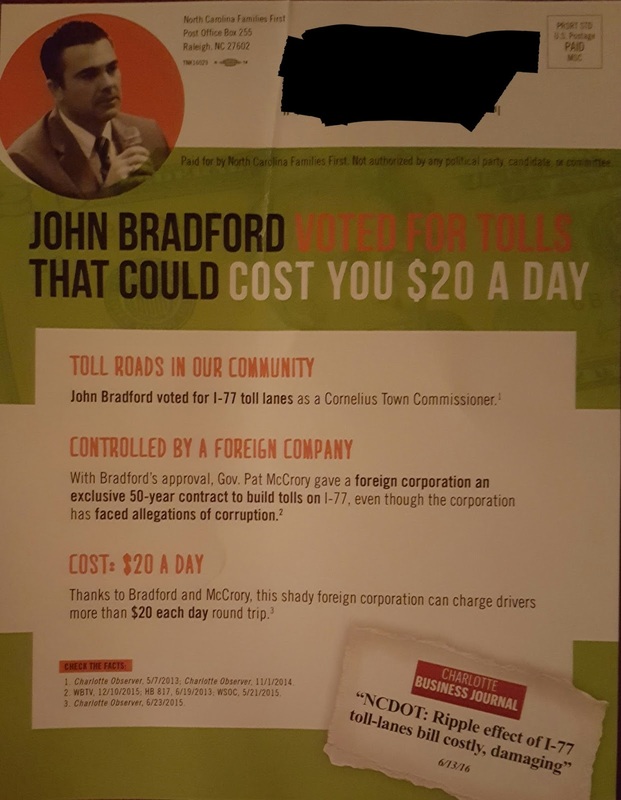 #NCGA: 2nd anti-Bradford mailer from shadowy group hits area mailboxes. On Wednesday, aShortChronicle told readers about a mailer from NC Families First - a partisan, dark money spending operation with a history of going after Republicans. The mailer that landed that day went after NC-98 Rep John Bradford on the I77 toll issue. The points made on this second flyer were exactly the same as the ones made in the first, so there's no need to debunk them again here. There was something interesting noticed with this second one. On Tuesday we told you about the previous flyers mailed in support of Campbell by the Democratic Party of North Carolina. 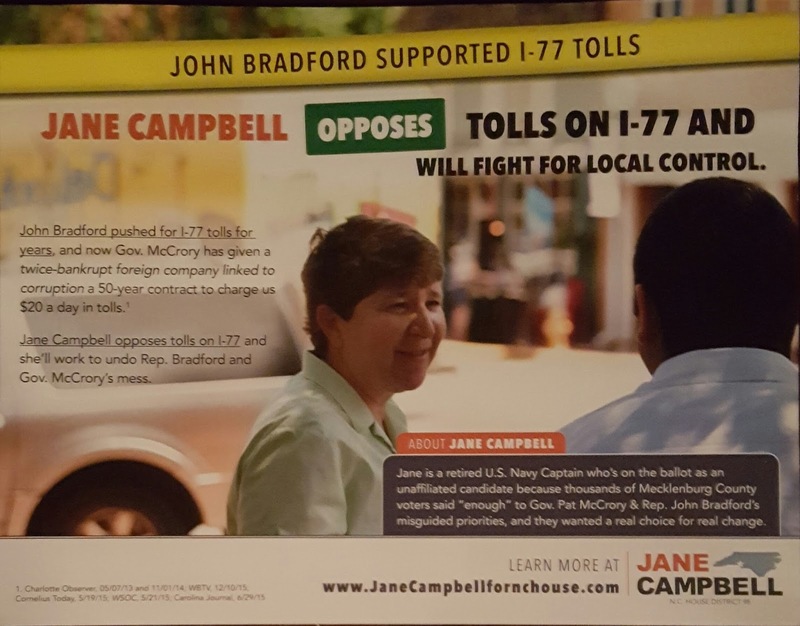 All of these flyers were Authorized by Campbell and all had some level of focus on the I77 toll issue. One of those mentioned Bradford specifically. 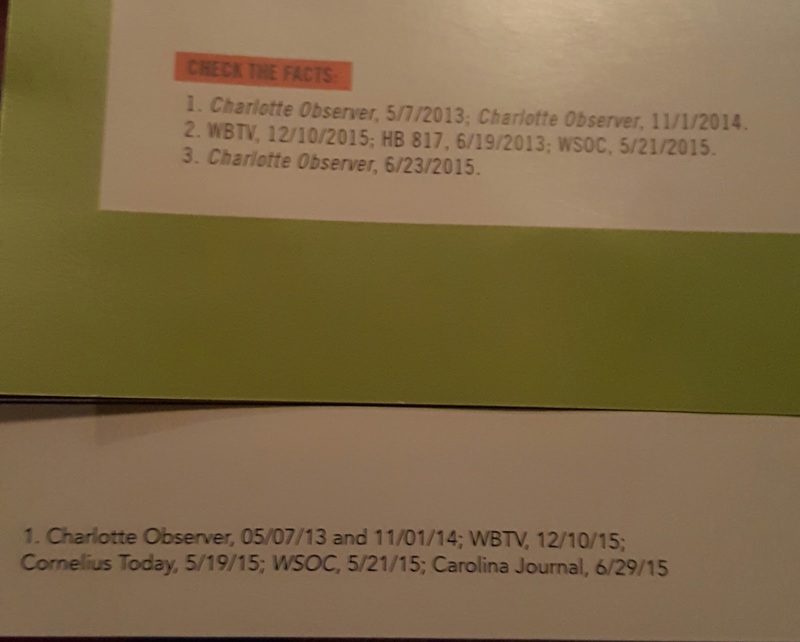 In the bottom left hand corner of both flyers lists the "fact check" references for the statements made. Here they are up close. The top is from NC Families First and the bottom is from the NC Democrats. Notice anything? Take a good close look. Four out of six references on each flyer are exactly the same. Out of all the stories on the I77 issue done over multiple years by various print, TV, and online media outlets these two completely independent operations pick the same four out of six media reports to reference in hit pieces targeting the same person. One paid for by the Democratic Party and one paid for by a dark money operation with 2014 campaign ties to the "eviscerate" crowd. Who really wants the new Griffith Street Hyatt Place hotel? The long awaited application for the proposed Hyatt Place hotel next to the Community School of Davidson finally landed at Davidson Town Hall the last week of August and hasn’t taken long to raise eyebrows. An email to Patel seeking more details got this response. “We are still in the middle of the process of working out the final details of hotel design with our architects and the Town of Davidson, so it would not be appropriate for me to comment on room size or height yet because those items may change”. That may be the company policy, but an August email obtained via public records shows Patel told the town Planning Director the estimate was for 110-115 rooms. Also, according to conversations with the Planning Director last week the discussions have been around a 6 story building including a rooftop restaurant as the 6th floor. The amendment for 68 feet in the application would accommodate this. It is safe to say opposition to this hotel site specifically - not another Exit 30 hotel - is brewing. So, “who wants this site?” is the obvious question. The media contacts at both institutions were reached for verification. None of those are ringing endorsements of this site for a new hotel. It seems the only institution that may want it there, other than the developers of course, may be the institution of Davidson Town Hall. 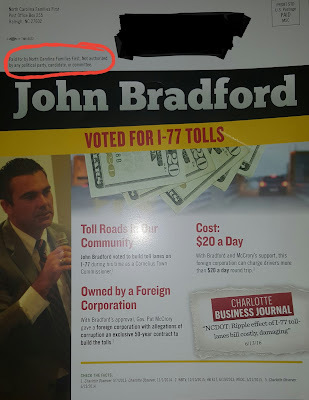 #NCGA: NC-98 Rep John Bradford about to get "Blueprinted"? Is the race for NC House 98 about to get ugly? This spring, Unaffiliated candidate Jane Campbell of Davidson waged a successful petition effort to get on the ballot for the NC98 race after the official filing period for this election cycle was over. HB2 was what motivated her to get into the contest according to her campaign website. Without a candidate of their own the Democrats have jumped in full force behind Campbell. Over the past couple of weeks1 three different 8x10 mailers from the Democratic Party of North Carolina landed in local mailboxes. All were in support of Campbell. Interestingly, only one barely even mentioned HB2. 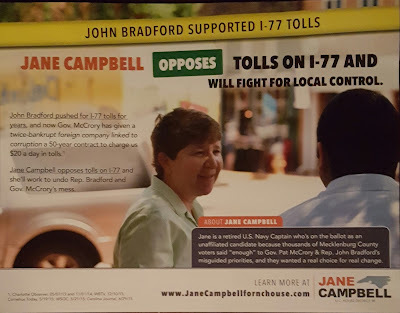 Instead, all three prominently featured Campbell's stated opposition to the I-77 HOT Lanes project. That's a testament to the power if that issue locally. And frankly, it would be surprising if any candidate running for office in LKN didn't use it. On Wednesday though a fourth mailer arrived. This one from an outfit called "NC Families First". So, who is NC Families First? Well according to FollowNCMoney.org it's a dark money group that spent over $2.2 million on 2014 NC State Legislature races - all on ads against Republicans. The group seems to be an end point of a money trail - meaning it's the one actually buying the ads after the money flows through other groups. No reports are up on the State campaign finance site for this group this cycle. But, where did NC Families First get its money in 2014? In 2014 it got $1.74 million from "North Carolina Citizens for Protecting Our Schools". That group got a lot of its money from the NEA and a number of other left leaning organizations. NC Families First also got $100,000 in 2014 from a group called America Votes. Well, they would probably not be known to anyone if it were not for their executive director, Jessica Laurenz. Laurenz penned the now infamous "eviscerate" memo circulated at a Blueprint NC meeting back in early 2013. That memo single-handedly coined the term "Blueprinting" as a reference to going after Republican candidates by any means necessary. The dishonesty on display in the most recent ad against Bradford shows where this is likely to go. It starts with a truth. Yes, Bradford voted to keep the project alive as a town commissioner in Cornelius. He also won reelection after doing that. The ad conveniently let's readers believe Bradford has been a suporter of the project all along. In fact, once the contract details started to be known inuding the potential toll rates Bradford opposed the project. He was one of the signers of a letter from a majority of local commissioners asking for the contract to be delayed. He also helped lead the charge in tbe NC House along with former Rep Charles Jeter to cancel the contract after it was signed. Finally the ad quotes an article which is largely referencing a letter from NCDOT Sec Nick Tennyson - arguably the most pro-toll bureaucrat in the entire state. It will be interesting to see who is funding the oh so innocently named "NC Families First" this election cycle. If it's once again the "eviscerate" crowd the race for NC-98 could be about to get ugly. 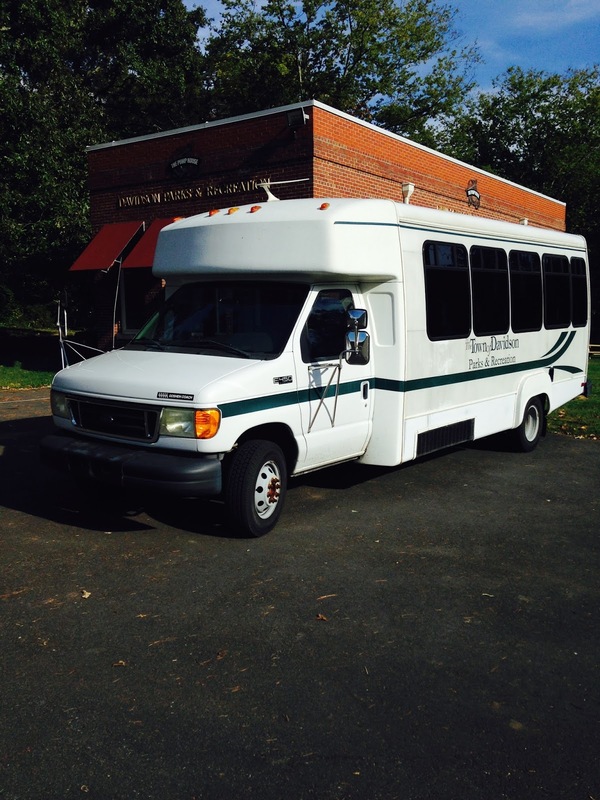 After just two weekends, Davidson's new Saturday shuttle is expanding to cover both the East and West sides of town starting September 17th. 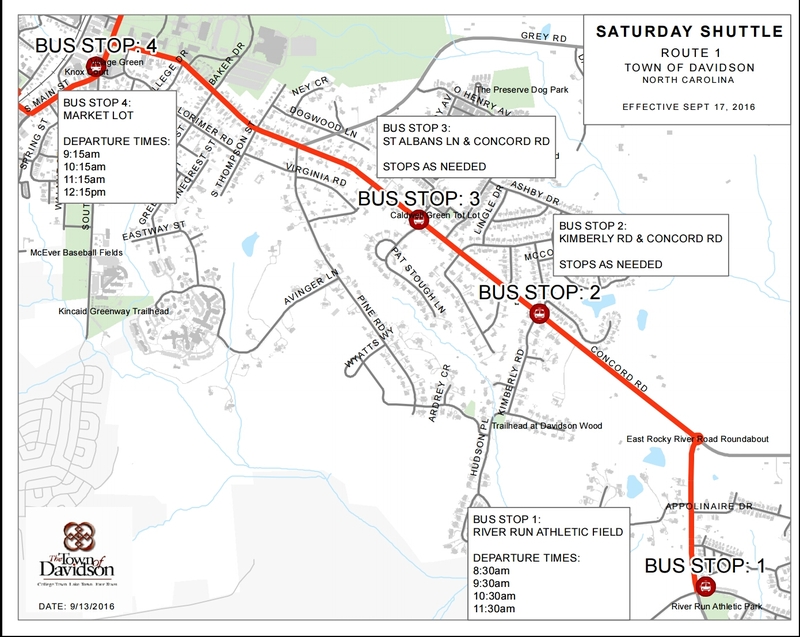 When the free shuttle service launched September 4th it ran one route from the River Run soccer field on Davidson-Concord Road into the Farmer’s Market. Unofficial reports were that it carried just under 50 riders on that inaugural day and that it included s mix of people who typically drove to town as well as people who did not usually go at all due to the parking situation on Saturday mornings. However, there were also some complaints (again unofficial) that the service didn't cover the West Side of town. This weekend that will change - along with the run times. 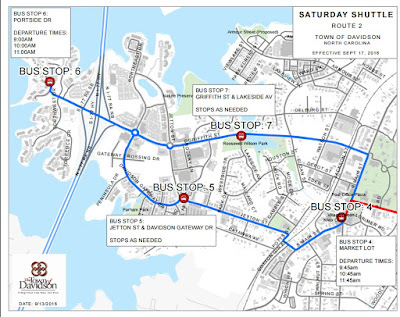 The new schedules appear to be organized to allow a single bus to serve both routes. This means longer times between inbound and outbound on each route, so don't miss your departure unless you have another hour to kill. The good news is that when you catch the bus in you will have at least an hour before the next bus back. That's plenty of time to hit the Market or catch a quick breakfast. 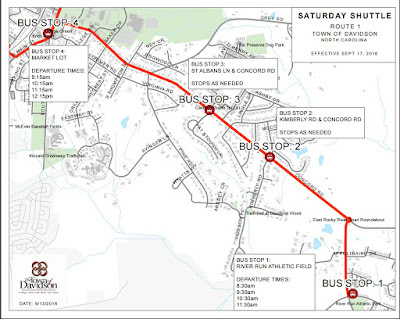 Route 1 will run a loop from the River Run athletic field to the Farmer’s Market lot. 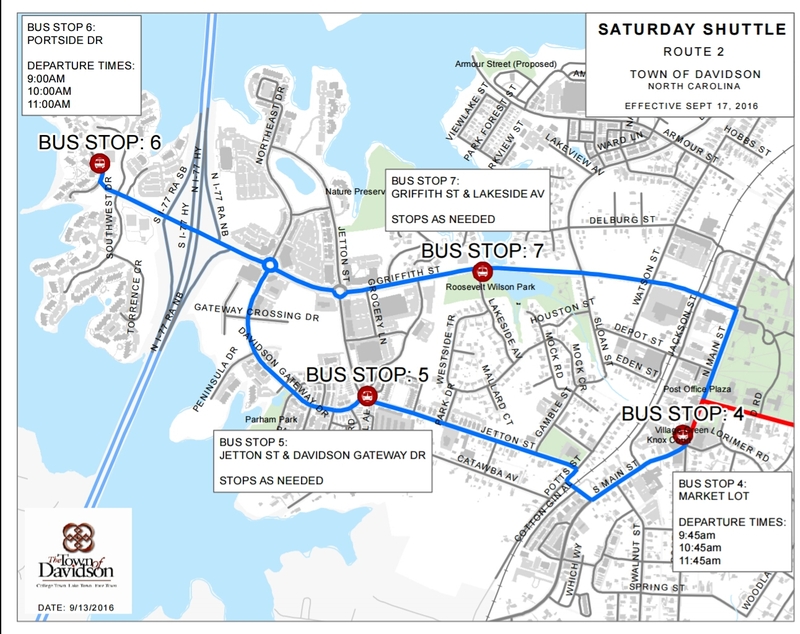 Route 2 will run a loop from Davidson Landing to the Farmer’s Market lot. 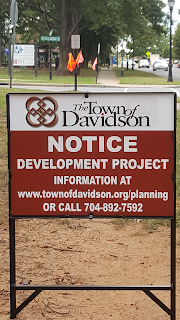 The agenda for Tuesday's Davidson Town Board meeting is up, and for residents of the Bradford neighborhood it holds two items which have long been sought-after for quite some time. The first is in the consent agenda and likely won't be discussed directly. 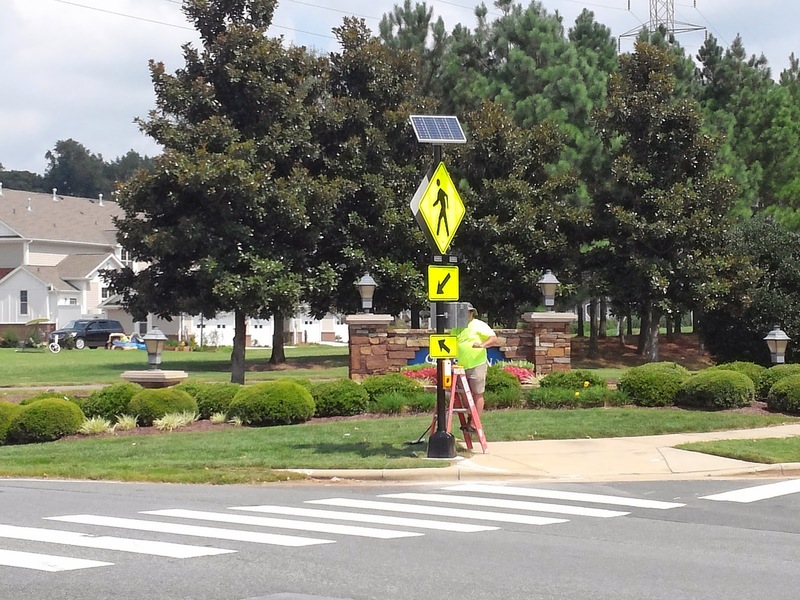 It's an agreement with NCDOT for the installation of flashing beacons at the intersection of Davidson-Concord Rd and Apollinaire Dr. Similar beacons are at the dangerous Robert-Walker/Davidson-Concord intersection just down the road. Readers will remember the recent discussion about lowering the speed limit along that stretch of Davidson-Concord. After significant citizen input and pressure, NCDOT agreed to lower the speed to 35mph from 45mph. That had been something desired by the Town for years. The most recent round of public discussion kicked off after aShortChronicle posted these videos of multiple traffic incidents involving school buses at the Apollinaire intersection. The beacons at Apollinaire will be a welcome addition now that school is back in session! The second item on the agenda is an agreement about repaving most of the streets in Bradford. 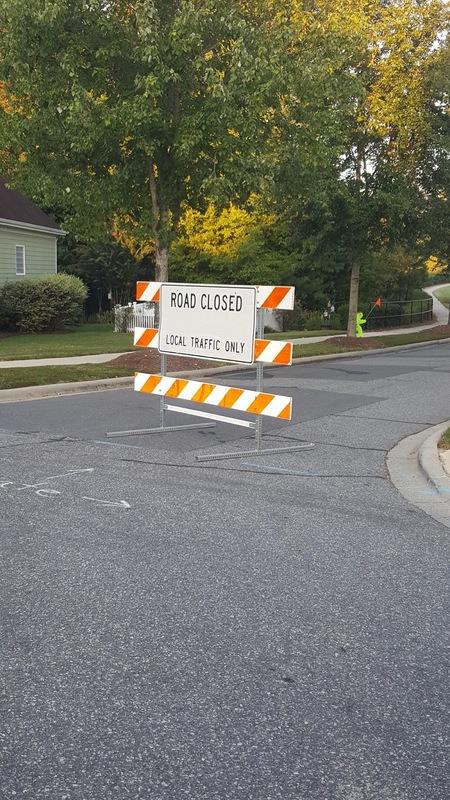 For the past few years the Bradford HOA, the Town, and the neighborhood developer have been working on a plan to remediate issues with the streets before the town takes over control as development completes. The developer has bonds with the town that can be used for this. Additionally, as part of an earlier agreement $25,000 per lot sold has been going into an escrow account to fund these improvements. 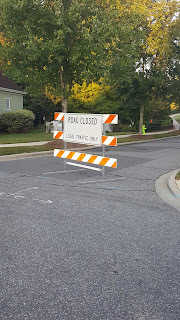 Work began last week on what's called "full depth reclamation" of all streets in the neighborhood except for Wooden Tee which was determined to not have the same subgrade issues causing problems elsewhere. Details of the final agreement are not yet up on the town website, but closing this project out will be a welcome relief to homeowners. When the application for the proposed new Hyatt Place on Griffith St next to CSD landed on the town website, one of the first things that jumped off the page was the number of parking spaces "provided". That number would be 118. One thing about developments and parking is that parking isn't so much "provided" as it's "required". Municipalities tend to have requirements built into their planning ordinances. Often there are specific requirements for specific uses such as hotels. What's interesting is that after spending years rewriting its own planning ordinance, Davidson's doesn't mention anything specific about hotels. According to a discussion had with Davidson Planning Director Jason Burdette at Tuesday's Transportation Plan Open House at Town Hall, the standard commercial requirements would have to make do for a hotel. Those requirements state a minimum of 2 spaces per 1000 sq ft of development up to 3.5 spaces per 1000 sq ft.
At those rates, 118 spaces implies a hotel between 34,000 and 59,000 square feet. Another way to estimate the size of the hotel is using the info on the Hyatt Place development guidelines website. Starting with 115 rooms (a number provided to the town in August) and applying the guidelines gets a hotel a little over 50,000 square feet. The real question is this. 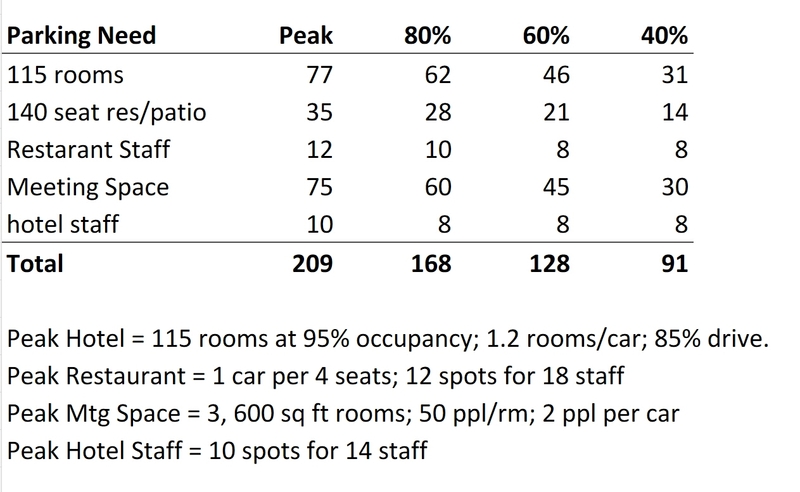 Does only 118 spaces provide enough parking for a hotel with 115 rooms, nearly 1800 square feet of meeting space and a full service rooftop restaurant and outdoor dining space? The simple answer is very likely not. The situation is made worse when one considers the 118 spots includes 19 spaces of street parking according to the preliminary project diagram. According to multiple articles and looking at different planning ordinances that do address hotels, the best way to estimate parking needs is to look at each use for the hotel separately while factoring in different things like distance to the airport, is the restaurant open to the public, and how many staff are needed. In the absence of the town having its own detailed requirements, aShortChronicle pulled together the below model for the parking needs for 115 guestrooms, 1800 square feet of meeting space, and a 140 seat full service restaurant with outdoor seating. Maxing out all those uses for parking to achieve a "peak" parking need and then taking 80%, 60%, and 40% of those peak uses allows one to mix and match numbers for different scenarios. The assumptions in the above chart make an honest attempt to not double count the need for parking between uses. For example restaurants often have 1 parking spot for 3 seats and 1 parking spot for every two bar seats. This model used 1 parking space every 4 seats and did not separate out for bar seating to accommodate for the fact that some restaurant patrons will also be hotel guests whose parking need is counted under for hotel category. The model also minimized the need for hotel and restaurant staff parking by assuming 1/3 of staff will walk or carpool. If these assumptions are wrong then parking needed is more likely to go up, not down. Additionally, staffing numbers for hotel and restaurant may me low. So, what are some obvious scenarios. The Wedding: It is easy to see a wedding or similarly sized event maxing out all uses. That would mean the hotel is a full 91 spaces short of its needs. 209 - 118 = 91. This assumes this occurs when school next door is not in session and all on street parking is available. The Daytime Business Forum: While peak parking need for this hotel will likely be in the evening for hotel and restaurant uses, any full use of the meeting space during the day will conflict with the peak parking need of the Community School of Davidson next to this site - meaning the street parking will be in use. Taking the other uses at the hotel at 40% and adding the peak use for meeting space yields a hotel parking need of 136. In a worst case, none of the street parking is available because of school use. Meaning a total hotel deficit of 136 - 118 + 19 = 37. The 60% Capacity Use Case: Maybe the most concerning is the "average" use of all aspects at the same time. It seems reasonable that could occur regularly. If 10 on street parking spaces are in use already, then the hotel would have a 20 space deficit. 128 - 118 + 10 = 20. It should be noted that any existing and new on street parking will be heavily used during the day by the existing school as the current parking capacity on the hotel site becomes unavailable. Mix and match the numbers for your own scenarios. There are likely more that will cause issues. Pick apart the assumptions as well. If this concerns you, contact the Davidson Board to encourage them to address this issue before they even consider approving this site for hotel use. 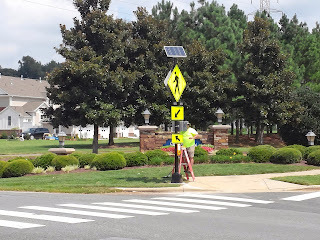 Reach the Board at board@townofdavidson.org. This week brings updates on a couple of citizen led initiatives previously reported on here at aShortChronicle. In early August we told you about the Adopt-A-Cop initiative started locally by Christine Feeney of Davidson. The effort had s goal of raising $3600 for 6 replacement bullet-proof vests for the DPD. On Tuesday, Feeney was happy to report that the effort raised $4155, just $45 short of enough for a seventh vest. Excellent work! Thanks to all who donated! Just so there is no confusion, one thing needs to be noted. The fact that this effort was raising money for vests does not mean the town didn't budget for them. (Some readers thought that might be the case back in August.) The funds raised for the vests will allow the town to re-prioritize for other needs. Officers will get to know however that the vests they are wearing came from citizens who cared enough to give. In a second, bid of "Good Citizen" news this week, the Davidson Community Garden reports another strong season of food donations to the Ada Jenkins food pantry. 1784 lbs have been donated so far this year, well on the way towards the annual 1-ton goal. The Davidson Community Garden has become a mainstay of citizen volunteerism as it now ends the seventh summer. In the most recent email from Connie and Eddie Beach who oversee things, they remind readers of the involvement of Davidson College students who have been a source of volunteers since the beginning. The garden which was the Brainchild of Connie and Eddie does a great job at bringing in people from all walks of life in Davidson to share in a common goal. Just a couple of examples if why Davidson is a great place. If you've got an example people should know about, leave it in the comments. In earlier posts, aShortChronicle told readers about the possibility of previous closed sessions on the subject of the Davidson Depot site. After shining the spotlight on the subject, Town Hall cancelled an additional closed session with developers on August 23rd. For the past two weeks, aShortChronicle has been trying to find out what was going on with possible incentives for the project. Specifically, the request was to understand if Commissioner Jenest recused himself from any previous discussion in closed session where incentives were discussed. "Elected officials and others are usually surprised to learn that there is no general law that prohibits board members from disclosing information obtained in a closed session. Disclosure of specific types of information is prohibited by separate statutes that make such information confidential (whether from a closed session or in any other context). So long as confidential information is not involved, board members are free to exercise their First Amendment rights to communicate about matters that are discussed in closed session." Tuesday, the answers from Town Hall finally came. Davidson's new Town Attorney, Cindy Reid, provided the following. "As permitted by NCGS 143.318.11, the Board held a closed session in January 2016 about the proposed project for the Metrolina site. Commissioner Jenest attended the closed session and disclosed his involvement with the project. He was not required to recuse himself and/or ask the Board to excuse him as no vote was taken. Because the purpose of the closed session for economic development is no longer in effect, information from the closed session in January can be released. The developer asked for consideration from the Town for assistance for the project. Possible items were synthetic TIF (tax increment financing), a brownfields grant, stormwater exemption, and utility relocations/street improvements. The Town made no official response in the closed session to the requests." Commissioner Stacey Anderson clarified that the developer did not ask for any specific dollar amounts. A follow-up conversation with Mayor Pro Tem Beth Cashion confirmed this. Because there was no specific ask from the developer, there was nothing to vote on. On the plus side (if there is one) all indications at this point are that the Board strongly indicated no town support would be forthcoming. The list of things wrong with this whole picture is long, but here are just a few that jump off the page. 1. Closed sessions for economic development are "permitted" not "required". Why did Davidson even feel the need to have a closed session discussion on this? The town was not competing with any other town for the business. The public deserves to know exactly where elected officials stand on these issues. That's kinda hard to do when the discussions are held behind closed doors. 2. Who could possibly think it is ok for Commissioner Jenest to participate in a closed session discussion in any way when it involves his private sector client? Just because a recusal is not required doesn’t mean it should not happen. Commissioners regularly get excused from meetings because of personal issues. They have to step out for a few minutes or leave early for one reason or another. They've even been known to miss votes. Yet, when a Commissioner who is doing work on a project before the board enters a closed session where the possibility of incentives will be discussed, saying a recusal is not "required" is the response. 3. The statement from the town attorney mentions no vote being taken. That is of course true as votes can't be taken in closed session. However, let's suppose they had come back into open session and voted on something. Jenest would have recused himself at that point, but by then the damage would already have been done if he had participated in the closed door discussion and influenced the outcome. This is no way to run things if you expect voters to to have any trust in the openness and transparency of local government. #Catalyst2.0 - Is Davidson as committed to its values as Venice Beach in 2007? In researching the issues behind the proposed Hyatt Place hotel in Davidson, this article from the "Free Venice Beachhead" publication circa 2007 popped up. The similarities to the Davidson proposal are eerily similar. Here's hoping the outcome is the same as well. Original in itallics, commentary in bold. By Jim Smith Oct 1, 2007 "FreeVenice.org"
After nearly two years of meetings, hearings and general PR and BS, a big hotel project with rooms in excess of $200 a night has been unable to elbow its way into Venice. Behind the scenes meetings have been ongoing for a long time on this project in Davidson as well. The Ray Hotel, a project of The Ambrose Group – which has another hotel in Santa Monica – reached the end of the road, Sept. 19, when the West L.A. Planning Commission voted 5-0 to reject the project. From the beginning the hotel had exceed the dimensions of the Venice Specific Plan for maximum height and density. The five-story hotel would have towered 65 feet in places, in spite of a 30 foot height limit for buildings near the coast. The Hyatt Place proposal is for 68 feet with capability for a fully functioning rooftop restaurant. That accommodates 6 floors. The hotel was to be located at 901 Abbot Kinney Blvd., directly across the street from Westminster Elementary School. It seems that there are no local or state laws against having a building full of transients overlooking a school. The proposed Hyatt Place will be right across the street from Community School of Davidson, less than 300 feet from the playground. The project had divided Venetians from its first presentation at the Land Use and Planning Committee (LUPC) of the neighborhood council. This reporter had never been neutral about the project. According to the minutes of the Dec. 7, 2005 meeting, I urged the committee to send the developer packing since they were so contemptuous of the Venice Specific Plan. A lot of time and trouble could have been saved had the LUPC taken my advice. North Beach resident Carmel Beaumont also spoke against the hotel. Regardless, the LUPC voted 7-0 in favor of the project. It's hard to be neutral on a bad idea. At a follow-up meeting, several of the neighbors of the proposed hotel spoke against it, but their protests fell on deaf ears. Support or opposition seemed to fall along class lines. Those who could afford going to the two plush restaurants at the hotel gushed about the cutting edge design and how “green” it would be. Those of us who avoid yuppie restaurants thought more about the traffic it would generate, and the precedent it would set for more upscale hotels coming into Venice. We saw this a bit with the Catalyst Project and might on this one as well. Remember the Catalyst's "Lamborghini Guy"? Ambrose went all-out to get political clout. It retained as its spokesperson, Kristen Montet Lonner, one of former councilmember Cindy Miscikowski’s aides. For even more influence, Cerrell Associates, a big-time downtown lobbying firm, also was retained. More on this one later. Stay tuned. In spite of the support of some Venice blogs, architects and business organizations, there were more of us than them. The growing opposition to the hotel influenced councilmember Bill Rosendahl to take a stand against the project. At the West L.A. hearing, the preponderance of residents in opposition, the flagrant violations of the specific plan, and last-but-not-least, Rosendahl’s opposition, were crucial to moving the commission to its unanimous opposition. Let's hope Davidson finds its "Rosendahl". Promises from The Ambrose Group of a crosswalk and other gifts to Westminster School convinced the principal, Betty Coleman, to speak in support of the project. The hotel also pledged to pay a living wage and institute a local hiring program, however, none of its promises were enforceable. CSD is not taking a position on the hotel. That in itself is a position that might surprise some, but is also understandable. Fortunately, the school has a great relationship with DPD to address the inevitable safety issues if the project is not stopped. Am I the only one here who sees the irony in a boutique hotel which purports to hire lower-income residents from the community – when in effect these high-end developments are pushing these same residents out of the community because they won’t be able to afford to live there anymore?” testified Gail Rogers, a North Beach resident and teacher. The argument of job opportunities for the close by West Side neighborhood will surely be made. The same argument was made when Woodies was approved. The real impact will be the same as described for Venice Beach. At the end of the hearing, Joyce Foster, president of the commission invited the Ray Hotel developers to come back with a plan that did not violate the Venice Specific Plan. In the meantime, Venice remains the People’s Beach. The question for Davidson at the end of this looming debate will be similar. Who "owns" Davidson - the people or the developers? Permission received from Free Venice Beachhead to reprint the above article. When the Catalyst Project broke into the forefront of conversation in Davidson back in 2015, the thing that made it explode into controversy was inclusion of a hotel in the plan. That idea sank like a stone. But as aShortChronicle pointed out a couple weeks ago, Catalyst supporters at Town Hall were likely to get a second bite at the hotel apple with the proposal for a Hyatt Place hotel next to the Community School of Davidson on Griffith Street. See previous coverage of this bubbling story here, here, and here. Well, after months of delay since the story first broke in February, the application for the project is finally up on the town website. Here are a few of the lowlights which will likely raise similar concerns as those with the Catalyst Project. According to the schematic in the application, there are only 118 parking spots for the project. HOWEVER, only 70 are on the hotel site itself with 48 being made up of on street parking and shared parking with Woodies. This includes new on street parking along Griffith Street. Per information provided to the town on August 1st, the estimated number of rooms will be 110-115. Oddly, this tidbit was not included in the application. 115 rooms and 118 parking spaces, much of it offsite. Davidson must be getting the first completely robot staffed Hyatt Place because apparently there will be no staff needing to park as well. It is impossible to see how this "plan" does not create a permanent parking nightmare in the area. According to the application, because the project is less than 75,000 square feet no traffic impact analysis is submitted. This of course is completely ridiculous. Due to the pre-existing school adjacent to the project, twice a day on every weekday during the school year, there is major traffic in the immediate vicinity. Add to this the fact that by its very nature hotel guests will be unfamiliar with this daily traffic pattern and you have the makings of a very dangerous traffic situation every...single...schoolday. This will be particularly true during morning rush when traffic is already a mess in that area. If approved, this building will dwarf anything in the area. The project is pettitioning as part of the application to be allowed to build up to 68 feet in height. This will make it significantly taller than the buildings around it. According to information obtained as part of a public records request, these are the heights of other buildings nearby. Oddly, the application specifies 4 floors, but the previous references to the number of floors say 5 (with a possible partial 6th) while also asking for the same 68 foot height. More oddly, no renderings of what the building might look like have been posted to the town website. All of these concerns should sound familiar to those who opposed the Catalyst Project. For those reasons maybe this project should be called Catalyst 2.0. Bonus Observation:  Per multiple Facebook postings, Mayor John Woods is apparently emailing citizens implying this is a done deal and that the town's hands are tied. He probably thought the Catalyst Project was a done deal too.